Kim's Kitchen Sink: Guests (mostly) Welcome! 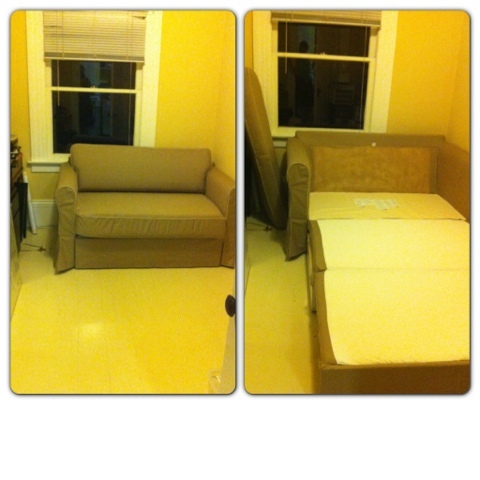 After all the drama, the sofa bed finally arrived! My dear friend Andrew came over for wine and assembly, and before long, we had wrapped it all up! The room still has a ways to go before it's truly comfortably guest-ready, but it's functional! IKEA Hagalund sofa bed, closed and opened. It's pretty comfy, and the cushions fold up with a cool zipper feature to make it look seamless. Bonus: storage under the seat! Can't wait to finish the room now...no more living room air mattress for guests at Chez Rohrer! Ha! It is cozy (code for small) :) It's a little like a storage room, but it is cozy. Sometimes you have to go with what works - and that works. I love when I find that perfect piece. Love Ikea for always seeming to have that perfect little something. Thanks, Jamie. It's true, IKEA is very good at "that perfect little something" :) Thanks for reading and commenting! its a gud idea but not new !! That's all you need, I use a trunk like storage for that kinda stuff .rather store it like so! I would love to have space for a cool trunk to hold this kind of stuff! I get so excited when I see them at antique fairs and whatnot, but alas, no room! Room is a key factor! Hmm..yes that would be up there! Money to build more rooms for more stuff like? How do you use Disqus?